Based out of Bridgeport, New Jersey, USA, the client has an 80-year-old history in providing customer stainless steel fabrication services. The client is one of the top manufacturers of food service equipment as well as custom-made high-end cooking ventilation systems for commercial use. The client also manufactures dish and tray handlining carts that revolutionized the food distribution in many commercial locations. The client has a wide range of products to help food service delivery, return, storage equipment. The client also manufacturers tray conveyers, hot food tables, tray dispensers, mobile dishes, delivery tray carts, along with insulated dinnerware. As an engineering custom solutions provider of food return and delivery systems, the client has created a name for itself as the provider of high-quality products. The client was looking to associate with a long-term engineering support services partner for designing 3D models of sheet metal trays. The requirements involved providing 3D modeling designs, using inventor, for serving and food processing units, dish and tray handling carts, etc. They needed an expert AutoCAD services provider to help with their fabrication design work. They also wanted their legacy designs to be moved from Cad to inventor. The project included components as well as whole product designs in inventor. 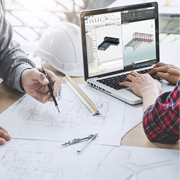 Challenges involved in comprehending the markups in the legacy files to create accurate 3D models that were accurate and ready to be sent to the manufacturing floor. Outsource2india has provided engineering support services to a growing list of happy clients from around the globe. For this project, the team involved seasoned inventor 3 modeling specialists who have ample experience in providing sheet metal designing work. The client provided PDFs of each design and our modelers created 3D models using inventor within the delegated time. The client created vaults to upload designs for universal access and use. The team consisted of two 3D modeling specialists and one quality analyst to create accurate 3D models. Outsource2india offers two decades of extensive experience in sheet metal designing and creating highly precise 3D models to help clients get functional designs. With proven project management processes and expertise in latest tools, O2I helps in reducing time and saves effort on complex designing projects. Contact O2I to talk to 3D modeling specialists at O2I for more information on sheet metal designing.